"I want to have something like that encounter someday as I want nothing else in this mortal life. And I want it for you. I want it for us all. Israel, Israel, God is calling—calling us to live the gospel of Jesus Christ personally in small ways as well as large, and then to reach out to those who may not look or dress or behave quite like we do, and then (where you can) go beyond that to serve in the widest community you can address." 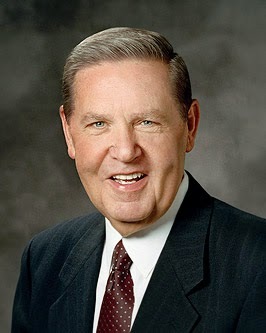 This is a bit of fascinating speculation by Elder Holland. At some point in the near future, the Savior will "cut short His work in righteousness" as the final scenes of this world are played out. When that moment arrives, what will you and I be found doing? Will it be something less than appropriate? Will we be engaged in idleness or selfish purposes? 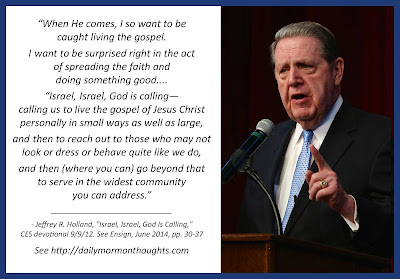 Elder Holland wants to be found, and hopes we all are found, "living the Gospel" in the best sense, in "the best way we can." I loved Elder Holland's speculations on what the personal interview at that moment might be like. It's very sincere, personal, honest, and pointed. And the message is clear: we must be ready for the event that might occur at any time!